The other day I ran across this lovely series of articles in the New York Times called "Why I love…". Here’s a great one breaking down a bit by Robin Williams. The articles are fascinating and super fun to read, but the "editorial UI" design here is brilliant (and subtle) as well. The way video clips, stills, and references are mixed with the text make it feel almost like cross-cutting B-roll in a documentary: you read a paragraph or two of the author’s comments, then see what they’re talking about. This sounds maybe simple or even obvious but getting it right on a webpage (that has to work on many devices, in many browsers, at many sizes) is an awful lot harder than it looks. The Gray Lady’s designers have struck a perfect balance in their layouts between text and illustration that allows each to enrich the other instead of distracting. The way the text background becomes a progress bar for playback is just… oof. I wish I’d thought of that. I ran across this short film this morning. I saw this for the first time a couple years ago and it was really nice to watch it again. I’ve been kind of obsessed with Carl Sagan for most of my life; Pale Blue Dot (the book the voiceover comes from) is an all-time favorite, one I reread more or less like it was scripture. Hearing his voice reading from it over these images honestly gets me a little choked up every time I watch it. Also! There’s a website with stills! I’ve found my new desktop wallpaper. Neat thing i discovered: this dude brews coffee in Boulder, CO and delivers it by bike, come rain or shine… or snow. Looking back at earlier in the year when boulder got 14 inches of snow... and freshly roasted coffee at your front door. You can order a bag of coffee and the Caffeine Fairy will pedal over and leave it on your doorstep. That’s almost enough to make me move to Boulder. There’s a great article about the founder (and his sweet Olivetti bike!) on Cycling Tips. Schnyder is a really nice new display serif family from Commercial Type, one of my favorite foundries.1 Originally designed for the logotype of the New York Times’ “T” magazine, they’ve expanded it into a full-blown typeface with several weights and widths. You can definitely see that this was designed for a fashion magazine; the fashion world loves their high-contrast serifs to the point that it’s all but cliche, but the quirky, playful character of Schnyder makes it feel a bit more unique. I love the angled cuts on the tops of the lower case stems. And look at the way the lowercase “a” and “u” talk to each other in “Paul” at the bottom. Very nice. This weekend I got to see a local Indian classical concert - a few ragas by a santoor player, accompanied by tabla drums. It turns out the santoor player had actually studied with Pandit Shivkumar Sharma, a famous musician and scholar. I actually have an album with P. Sharma playing with the ridiculous drummer Zakir Hussein, so it was doubly amazing to get to see the same instruments and songs played live. Wow, I’m still alive. Let’s do that again. Akwasi Frimpong, 32… remembers thinking on [his] first run [on the sled]: "Oh, man, I’m going to die. You want to brake, but there are no brakes. If there was a button to press stop, I would have." But then he got to the bottom nearly a minute later, alive, and recovered his athletic instincts. "The competitiveness in you says why not go back up and make less mistakes and go even faster," he said. I wonder how many great inventions and accomplishments have happened after moments like that in human history? "Well, that was dangerous and terrifying… but I bet I can go faster if I try again." Designer Tobias van Schneider posted a really interesting post-mortem reflection on his ".Mail" email client project. I remember seeing his concepts for the app back in 2010 or so, and they were really brilliant. You can see a lot of ideas in there that have become standard in modern email clients: swiping for actions, simplified account sidebar, avatars/social integration, and lovely minimalist type treatments. His case study/pitch was the first place I’d seen them; I can’t say for sure he invented those UI patterns, but they certainly weren’t common before. As a product it may have failed to launch, but as a piece of UI design it was really influential. This was also shortly before Sparrow got acquired by Google and then killed, and I remember desperately hoping .Mail would take off so the world 1 would once more have a usable email client. I signed up for the email list and checked the case study occasionally, hoping to see an Available now! callout appear there. But, sadly, email protocols and APIs are a horrible quagmire of sadness and despair and knashing of teeth, and it was not to be. But many of van Schneider’s ideas were picked up/stolen/borrowed by Dropbox, Spark, Polymail, etc., and we now have at least a few pretty damn good email clients, perhaps with .Mail to thank for it. Also, Tobias van Schneider has perhaps the most amazing beard in the design industry. This is a really lovely blog of painting and illustration. I like to look at it every morning because it makes for a wonderful few minutes of peace and inspiration. And the notes on technique and history are really great - I’ve discovered lots of artists here I’d never heard of. The work shown is usually quite traditional, broadly in the figurative, landscape, and still-life veins, but I really appreciate that no lines are drawn around canon figures; editorial and advertising illustration is happily showcased alongside museum-vaunted artists like Monet and Rembrandt. The author seems interested in great lines, brushwork, and color wherever they find it — and their mining has surfaced some amazing diamonds. “FF Attribute” is a new sans family with both monospace and regular (kerned) versions — this is not unusual, per se, except that the two versions use (what looks like) almost identical character sets. One character set is versatile enough to do double duty as either text or code, with minimal modification. Thom Björkland is one of the most amazing natural history illustrators I’ve ever seen. I especially love his portraits of prehistoric people - they’re so alive and full of personality. I’m excited about this: “Luna Display” is a new hardware piece from Astropad, allowing you to use your iPad as a Cintiq-like second display with a Mac. I’ve used Astropad for a long time, and it’s fantastic. It’s one big limitation, though, is that it mirrors the Mac display rather than extend it. When I’m working, I really like to have reference imagery up on the main display to glance at, and looks like Luna would actually make this possible. When we visited my parents a few weeks back, we took my daughter Evelyn to a farm/petting zoo near my hometown. It was a lovely clear day and I followed her around with my camera as she “milked” a wooden “cow,” fed (real) goats, and stomped in some choice puddles. Diwali is this week! I love the symbolism of the ‘festival of lights’ and find the tradition incredibly beautiful and inspiring. One of my favorite bits of verse is from a Sanskrit hymn called Jyota se jyota, which Diwali often reminds me of. Those two short lines strike me as one of the most profound and sincere prayers I’ve ever heard, and I try to remember them often. May we all see by one another’s light this week. This interview piece in the Times is excellent. I’m a huge fan of the Golden Compass/Northern Lights series and I was happy to find that Pullman himself seems like someone who’d be fun to get a cup of tea with. But most of all, I realized this is very much how I hope to look when I’m 70. 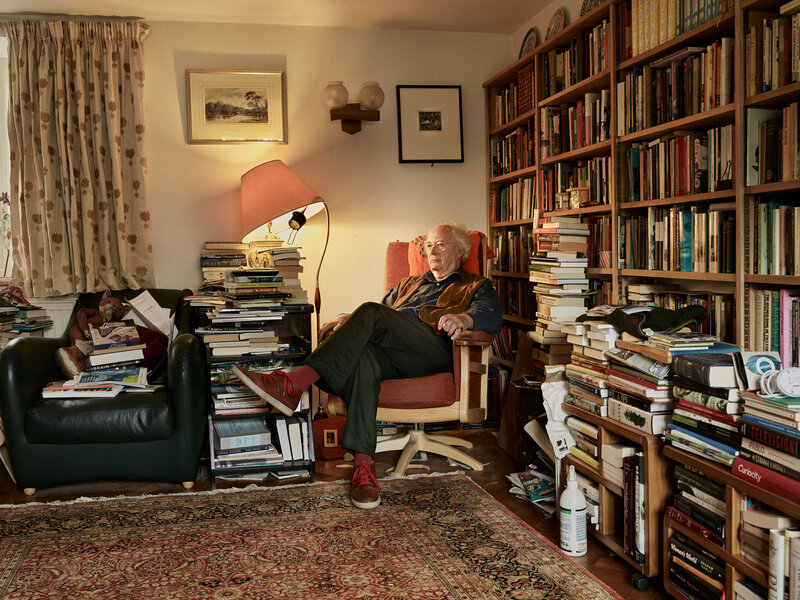 The wiry hair, the red sneakers, the rooms piled with books — I’ll take all of it, thanks. Today I’m flying to Dar es Salaam on a business trip; we’re working on a project serving communities in East Africa, and we’re planning to meet some of our early beta testers and build relationships with local designers and developers. I’m excited about the trip but also nervous, simply because this is the first time I’ll be away from my family for a whole week since my 2-year-old daughter was born—not to mention the first time I’ve left the country without her. It was pretty hard to drop her off at daycare this morning, knowing that I won’t see her again until next week. And I’m headed to a place with which I’m really unfamiliar, where any number of things could go wrong. Font Review Journal is a lovely site offering thoughtful reviews of typography with the nerd turned up to 11. Yay: typographic rabbit holes are a thing the internet needs more of. Check out their review of one my perennial favorites, Galaxie Copernicus. I'm sitting on the docks tonight at the lake and there's a kid, a bit south of 20, I'd guess, wandering up and down the pier, snapping photo after photo on his phone. it's a beautiful, early-spring evening, a little chilly, but there's golden sunset light bouncing all around and the surface of the lake is lit up by the turquoise sky. A great evening to take pictures, in fact. I've been watching the kid out of the corner of my eye, remembering how at his age I used to wander for hours around the old parts of Staunton, and the even-older parts of Baltimore, taking pictures with my old film camera. It's inspiring to see him here, admiring the evening with his brilliant little networked pocket supercomputer. I wonder what stories he's putting together. I’m very sad to hear that Lennart Nilsson died today. He was a photographer who deeply influenced both the art and science worlds, and was a hero of mine. Versatile and technically innovative, he was known best for his medical work. In the 1960s he was the first person to photograph a fetus in utero, documenting its entire development from egg to birth. Such images would be amazing just for existing, but the images he created were also incredibly beautiful. They had perfect exposure, sharp detail, and gorgeous composition. His work was as poetic and expressive as it was scientifically groundbreaking. You’ll be dearly missed, Mr. Nilsson, and you’ve left us an inspiring model to follow. Last week I was working on some new ink drawings (using brush and pen) and started running low on paper. I made a run to the art store down the street to re-up, figuring on a 20-minute errand: walk in, pick up the usual, then be on my way. But they didn't have my usual paper, and I realized I had no idea, really, what I should be looking for in an alternative. I found myself standing there in the paper aisle, wandering back and forth, staring at the shelf labels; 20 minutes came and went, and then another. Operator: Maryland Poison Control, how can I help you? Me: Hi, my wife just got stung by a… (scrolling through pictures on phone) 'saddleback moth' caterpillar and she's in a lot of pain. Do we need to go to urgent care? Operator: Well, it's usually not serious. It's painful but it rarely lasts more than a few hours. Use scotch tape to pull out the needles, wash with soap and water, and apply ice to reduce swelling. Benadryl will help with the irritation, Tylenol for pain. Me: Okay, great, thanks, we'll do that. Operator: No problem. Just for our demographic data, can I get some information?… (asks a list of questions) … and how old is your wife? Me: "Well, funny you should ask. Today is her birthday. Operator: (laughing uncontrollably) …um, happy birthday? Me: …Thanks. The party never ends here. Operator: "Uh huh. Give her some Benadryl. Wife (in background): ASK HIM IF I CAN KEEP DRINKING. My brother Andy went to Germany last summer as part of a research project for the engineering degree he's working on. My brother is a gearhead, talented mechanic, and a fan of stout-style beer; Germany is essentially paradise for him. This three-month trip would be his first experience living abroad, in a place where he didn't know anyone, and where he would be immersed in a language that he didn't speak natively (though he had a few years of German classes under his belt). I found a specialty pen shop nearby, where I picked up this great Pilot Namiki fountain pen. Super smooth, and allows just a bit of modulation in the line, nice heft to it. My wife's family often goes on vacation in Ocean City, MD, a place where you can find excellent milk shakes, vinegar fries, shuffle bowl arcade games, and old-school, non-digital photo booths. Oh, and the Atlantic Ocean is there too, but everybody is usually more excited about the milkshakes. My favorite part, though, is visiting Asateague Island. A small offshore island near the Virginia-Maryland border, it's about a half-hour drive away. The entire island is a national park with rare herds of wild ponies and spectacular sand dunes and marshes. If you can bear the mosquitoes it's a great place to hike. I grew up in the Shenandoah Valley in Virginia, in a town called Waynesboro. It's one of the largest towns on the Appalachian Trail, but that's probably not saying much if you're reading this in Queens. Or, say, Baltimore, where I'm writing this. To much of the urban world, Waynesboro looks like a dozen buildings lost in endless cowfields. But that's why I always look forward to driving home. Part of me loves the energy and complexity of cities but the rest of me prefers open space and quiet. If I stay away from the mountains too long, I start to feel lost. I was hiking in the mountains, back home, on a cold, overcast day and I came across a very old tree. Dead on its feet, its bark was starting to split and rot away. Shelf fungus had begun to grow and climb its trunk, forming bulbous, rhythmic stairsteps that reached toward the branches. When I see a tree like this, I can't seem to walk past it. I don't know why, exactly, but there's something about fungus that strikes me as both alien and familiar, something both playful and a little unsettling.